If you have ever been in a place where you think everything is going terribly and that you are not okay, this episode is for you. While decluttering my house this weekend, I found an old sheet of questions to ask when you’re not feeling okay, and I wanted to share this tool with you. I will also share my thoughts on each of these steps, as well as specific ideas and examples of how these can work to break through this rough time. One of the most important things when dealing with hard times is the ability to take a step back and give yourself a chance to understand what’s going on. You have to give yourself time to shift your mindset and recover. We cannot always predict when everything will become overwhelming or something unexpected will come along and throw us off, so it’s super valuable to have a list like this to turn to that will help you get back on track. The special gem I found while decluttering over the weekend. Questions to ask when you’re not okay. The importance of taking small steps to care of yourself. The power of appreciation and taking time to reach out, no matter how you feel. Why loving touch is so helpful. One of the most important things to help you get through a tough spot. A few techniques (that work!) to help you fall asleep. One thing I would add to this list of questions. 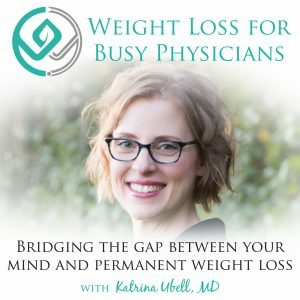 Katrina Ubell, MD: You are listening to the Weight Loss for Busy Physicians Podcast with Katrina Ubell, MD, episode number 108. 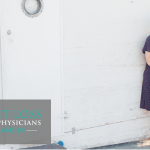 Welcome to Weight Loss for Busy Physicians, the podcast where busy doctors like you to get the practical solutions and support you need to permanently lose the weight, so you can feel better and have the life you want. If you’re looking to overcome your stress eating and exhaustion and move into freedom around food, you’re in the right place. Hey there, my friend. How are you today? I’m so glad to be talking to you. How fun is this? Listen, I want to share with you that I just had the most amazing weekend. My friend, Shira Gill, who is also a coach. I flew her from San Francisco, out to my house here in Milwaukee. I had her spend two days with me going through my house. Here is the deal. She’s a coach. She’s be on the podcast before. She’s a decluttering and organizational expert and is a coach as well. I had done her online program, and it was amazing. Here’s my thing with decluttering, this is my history of decluttering. I end up doing about 90% of it, but I end up never fully getting a room to 100%. Do you know what I mean? You do most of it, but there’s always that one drawer that you’re just not sure of, or there’s just like those couple of things you didn’t really know what to do with, so they’re still sitting there. You’re never, really, fully taking it to the finish line. I had been in person with Shira, I think, back in October. I said to her, “You know what, I think I want to fly you out, and let’s just do this.” She’s like, “Absolutely, let’s do it.” I flew her out, and we had so much fun. If you follow her Instagram, you probably saw some of it. She came, and we were just going through my whole house basically. We went through my entire basement, my entire first floor, and my entire second floor. One thing we did not hit was the attic, but that’s okay because, basically, all that stuff just needs to be gone. Everything just needs to go away. It’s not really organization that needs to happen up there. We went through everything, and it was so fun because we found all sorts of things that I’ve forgotten about. One thing that we found is this paper. I don’t even remember where it was. I don’t know where I got it from, but it’s something that years ago I printed off, and hang on to. She was like, “This is amazing. You should do a podcast episode about this.” I was like, “You know what, I think you’re probably right. It is really amazing.” That’s what I’m doing. Thanks, Shira, for the inspiration. I am doing this podcast on this little one pager that I will link to in the show notes pages, which you can find at katrinaubellmd.com/108 if you’re interested in putting this off. I think this is going to be really helpful for you to have for yourself, but I was thinking, as I was preparing for this, I think this would be really useful for doctors to have for their family members, any patients that you have that are really struggling. Especially if you take care of adolescents, I think, this could be really helpful or the college age, early 20’s kind of people. I just think for everybody, it can be very, very helpful. It’s just this one pager. There’s not a nice link to send you to. In fact, I had to Google it again because the link on the page didn’t even work. It’s just something you’re going to have to find on my show notes page. The name of it is … You’re going to love this. The name of it is Everything is Awful and I’m Not Okay: Questions to Ask Before Giving Up. I don’t know what the back story is on this, if it’s the giving up means taking your life, if it’s to that extreme or just giving up like, “My life is crap. I’m just not even going to try anymore,” or what exactly they’re referencing when they say, giving up, but I don’t think it really matter. I think the question to ask before giving up part, I think, it’s just questions to ask when you feel like everything is awful and you’re not okay. You know what I mean. I’m sure you’ve had these days where you’re just like, “Everything is terrible, and I can’t even anymore.” I, definitely, had those days. I’m sure you have too, especially when you’re exhausted, especially after a call, or particularly difficult day, or you’ve had some cases that didn’t go the way you wanted them to, or whatever it may be. Somebody was super mad, a patient, somebody in your practice was embezzling from you. I mean, there’s a million things that could be happening where you’re just feeling everything is awful and I’m not okay. It’s basically just a whole list of questions. And then, some we’ll answer. I’m going to read them to you, and then give you my little riff, my little take on them as well from a coaching perspective. The first one is, are you hydrated? If not, have a glass of water. I 100% agree. Don’t even just have a glass of water, aim for like 20 ounces of water. A little of water would be even better. Get a big bottle of water and glug that thing down. If you’re anything like me, I’m a little bit of a water snub. If I really want to drink a lot of water, it’s funny to me, this is my life, you guys. Okay. Something nice I can do for myself is get a smart water. One of the waters that has the minerals, the electrolytes in it, and water that taste really good. Some of you, where you live, the water already tastes amazing. My brother lives in Portland, Oregon. The water there straight out of the tap tastes so good. If you live there, you’re super lucky. It’s not like our water is gross, but definitely some of the bottled water is a step up. That might be a nice thing to do for yourself is have some of that on hand for all those times when everything is awful and you’re not okay, and you get to glug down a whole liter of smart water, or Essentia, or whatever the brand is that you like. Okay. You, definitely, are not drinking enough, baseline, is my guess. Okay. The next one. Have you eaten in the past three hours? Now, of course, this one, I was like, “This is the one question that I have a little bit of a problem with.” It says, “If not, get some food, something with protein, not just simple carbs. Perhaps some nuts or humus.” I do agree with that. Not having simple carbs is very, very important. If you really haven’t eaten in a long time, and yeah, then you probably need to get some food. Eating a solid meal will really, really help. Definitely something with some protein, definitely eating some vegetables. That’s definitely going to be a good thing for you to do. Now, three hours, you don’t have to eat every three hours. If you just had your full meal three hours ago, you probably don’t need to be eating. You probably just need some water. That’s my guess. Or one of the plethora of other things I’m going to tell you about. The next one is, have you showered in the past day? If not, take a shower right now. I think that makes a huge difference. Have you ever been sick, and you’ve skipped of the personal hygiene? You start to feel super gross and bad. I mean, just taking a shower. First of all, personal hygiene, cleanliness is one of the natural pleasures that we experience as human beings. There’s a reason that taking a shower or bath feels so good. Definitely, when everything is awful and you’re not feeling okay, taking a shower and cleaning yourself up is so helpful. I used to take care of this family. The mom had this high-level corporate job, and three kids. Her husband was involved in an athletic organization. He was gone all of the time. She had help and everything, but she’s still was just super overwhelmed all the time. She’s like, “I basically take a shower like three times a day. I just have to get away from everybody, so I can’t hear them all screaming and crying. I’m just constantly in the shower.” I’m like, “That’s so smart.” If your skin can handle it, it’s so smart. Just get in there and experience that natural pleasure. If you haven’t showered, if it’s your post-call, and you haven’t showered, and you’re feeling like, “You know what,” what you need to do is take a shower, for sure. Have you stretched your legs in the past day? If not, do so right now. If you don’t have the energy for a run, or trip to the gym, just walk around the block, and keep walking as long as you please. If the weather is crap, drive to a big box store, example Target, and go on a brisk walk through the aisles you normally skip. I think that’s such a great thing to think about too. So often, we’re either sitting at our desk, or sitting in a patient room, or standing in a patient room, or standing by the bedside as somebody, we’re not moving around. Those of you in emergency medicine are like, “I get 10,000 steps in the first three hours,” and like, “I’m definitely stretching my legs.” It depends on what you do and what your days are like, but if you have not really moved around, moving around will help you a lot. I, actually, think that there’s something to be said for being out in nature, getting fresh air while you’re doing it as well, if you can. Now, where I am, recently, we had a bunch of rain, and then it froze. It’s super icy out everywhere. Going outside and walking is just not a safe thing to do right now. In fact, in the past, I’ve tried doing it when the weather is like this and totally bitten it. I completely wiped out, completely was just like, “Why? Why do I push myself to do these things? It’s just not the right time.” You might even just go outside and literally walk up and down your driveway a couple of times and get some fresh hair if that’s what you need to do. There’s something to be said for being out in nature, and what that does for you, from a mental health standpoint. It’s so important. Okay. The next one, have you said something nice to someone in the past day? Do so, whether online or in person. Make it genuine. Wait until you see something really wonderful about someone and tell them about it. I totally agree with this. There’s something about, first of all, appreciating something in someone else, whether it’s something they are wearing, or the way they are acting, or their beautiful smile, or whatever it is, and then letting them know. When you see their face light up at a compliment, you get to delight in the joy that you just brought to them. There’s something about that that changes your whole mood. When you’re thinking like, “What’s something nice I can say?” just think about appreciating something else in somebody else. You can just say that to your medical assistant. “Hey, I really appreciate your hard work today. That was great. We really banged it out. I know it’s a tough day today, I really appreciate you.” When people are like, “Thank you. Thanks,” it makes you feel good because it puts you in that place of appreciation. I, actually, saw these two older women the other day both checking out at the grocery line. They must have been together, I think. They both head on these adorable crocheted hats with these very cute flowers stuck to them. They were adorable. I, seriously, almost said something to them, and then I didn’t. I don’t remember exactly why I didn’t, but I really should have. That’s the first thing I thought of when I was reading this. Have you said something nice to someone in the past day? I should have just said, “Hey, I love your hat. Those are just so great. Good for you.” I’m sure they would have been really excited by that. There’s just something about that that helps to put your brain into that framework of seeing the positive, seeing the good because when you’re in that place of everything is awful and I’m not okay, all your brain will show you is everything that’s awful and all the reasons why you’re not okay. Next one is, have you move your body to music in the past day? I am telling you what, this makes such a huge difference. Just one song. It says, “If not, jog for the length of an idiom song, which is like electronic dance music, song of your favorite tempo, or just dancing around the room for the length of an upbeat song.” If you don’t have your song that’s like a song you know that no matter what, when you play that, it lifts spirits, you need to find that song. I have many of them that I can come up with. Seriously, you need to just know like, “Right now, it’s time for Journey,” or whatever the song is for you. My kids love it when I pay Miley Cyrus’ Party in the USA because when I was pregnant with them, my little kids, I would have to go do those nonstress tests, especially since I had a loss before, they wanted me to go and do those. I didn’t want to waste any time. I was like, “Okay, listen. We need to have this baby wake up because I’m not going to sit here forever while this baby is snoozing.” I would drive to the hospital on my way to NSE playing Party in the USA on my phone directly at my belly. I held the phone to my belly and play the music in there to wake the baby up. Then, I’d get in there, the baby would be doing all that stuff. And then, whatever, 15 to 20 minutes later, I was done. The kids love that story, and they think that it’s so great. Every time they hear the song, they’re like, “That’s what you played for us.” Anyway, all of us will dance around, and we love that song. There’s something about just getting yourself moving and feeling that music that out-blasts your spirit. It’s so important to do things like that when you need too, when you need some energy too. Next one, have you cuddled a living being in the past two days? If not, do so. Don’t be afraid to ask for hugs from friends or friends’ pets. Most of them will enjoy the cuddles too. You’re not imposing on them. This is a good one too. I think, so often, we retreat. We isolate ourselves when we’re feeling really bad. That’s why having pets can be so helpful. Now, don’t get a pet. Take it from me having two puppies. Don’t get a pet if you don’t really want a pet. Man, oh, man, my dogs are a handful. Regardless, they are so fun, and we get so much joy out of petting them, and loving on them, and playing with them, and things like that. If that’s something that you’re wanting, then, definitely, you can think about that. A cat might be easier. I don’t know. I’m allergic to cats, so I can’t have one. I do like cats, but it’s not something that I’ve ever been able to have myself. That can be helpful. I mean, you’re not going to get anything from a fish. That’s probably not going to be so helpful. If you have kids, ask them for a hug. Give them a really, really good solid squeeze. Just reach out and hug someone. Even if it’s not something you would typically do, it’s totally okay to do that. I’ve been to a couple of these Tony Robbins events now. If you’ve never been to one, some of the stuff that they do after they have you jump around and dance, one of the things they have you do is they’re like, “Give seven people the most amazing hug, the most perfect hug ever.” You have all these strangers giving each other these, not just like a little tap, tap, tap, like squeeze. It feels so good. I’m telling you like a really, really good solid squeeze makes such a difference. It’s amazing. Dance around, and then hug somebody. It’s the best. Okay. Have you seen a therapist in the past few days? If you are one of my clients and in my group right now, I want to suggest to you that what you should do instead is ask for coaching either on a live call or type in your question for me in Ask Katrina, and then I will answer to you. That is a great way for you to connect. What it says here is, “If not, hang on until your next therapy visit and talk through things then.” If you are seeing a therapist, definitely see your therapist. That is a great idea. I think some of us are like, “I’m not going to join this group. I don’t have a therapist,” but having a friend to talk too, actually, carving out time to talk to somebody, like a trusted friend, or your spouse, or your sister, or your cousin, or your mom, or whoever it is that you have close relationship with can be really, really helpful. Just sharing what you’re going through internally, it’s basically like if I download but outside to somebody else, I think, can be very, very helpful. Next one is, have you changed any of your medications in the past couple of weeks, including skip doses or change in generic prescription brand that may be screwing with your head? Give things a few days. Then, talk to your doctor if it doesn’t settle down. I totally agree with this. I think that some of us, especially when we’re doctors, we’re just like, “Oh, it’s not a big deal. What’s the difference? It’s the same thing,” but some of our bodies are very, very sensitive.” If things are really wacky for you, and you don’t know what’s going on, it’s something to consider that you might really be having some sort of issue with the medication, and you might need to go back to what you were on before, or change the dosage, or something like that. Just something to keep in mind. The next one is, if day time, are you dressed? If not, put on clean clothes that aren’t pajamas. Give yourself permission to wear something special, whether it’s a funny t-shirt or a pretty dress. I would say too that put on clean clothes that aren’t pajamas or scrubs. There’s something about being in scrubs all the time, it feels like you’re just not taking good care of yourself. When you showered, and you actually put yourself in real clothes, it really does a lot for your mental health and your ability to see things in a fresh way. Really, really important. I think that’s really great. I mean, the teddy bear thing, you may not have a teddy bear, but maybe borrow one of your kids’ little stuff or something. You want something to just snuggle, or get a body pillow, or something. I think that’s a really, really good advice because we resist going to bed and we just think, “I don’t know. I’m tired, but I’m not just going.” Just give yourself the opportunity to try to sleep rather than thinking, “I have to go to sleep right now.” Just go in, snuggle yourself in, get comfortable, listen to some white noise, I think falling rain sounds amazing, and just close your eyes, and let things go. Now, one thing I will add is if you feel like your brain is just going, going, going, going, and you keep thinking about things, and you can’t make it stop, there’s a couple of things you can do. One thing is you can just watch your breath. Just pay attention to your breath. I find that if I have a lot going on in my brain that, sometimes, it still doesn’t work. It still is just intrusive thoughts about whatever the issue is that I’m dealing with. There’s a couple of things that I do on a regular basis that I, actually, find help me a lot. I wanted to share them with you. One is something that I learned in doing a meditation thing. I don’t even know if it’s something I was meditating once, and I learned this. What you do is you count your breaths. What you do is you count one on the in-breath and two on the out-breath, and the next one, three on the in-breath, four on the out-breath, and five and six, seven and eight, nine and ten. And then, you start over again. That’s five breaths, and you’re just counting one, on the way in, two on the way out, and then you continue going. I find that that gives my brain something more to do, so that I’m not easily distracted by the intrusive thoughts. Just, one, two, three, four. Before I know it, I’m as sleep. That’s one that can help. The other thing that I do if I, really, am having a hard time falling as sleep, or if I’m jet lag, or things like that is I do a full body scan. Although, hopefully, if I do it right, I’m as sleep by the time I get to my legs. What I do is I … This is just the way I think to myself. I just lay down. I physically relax everything. I think I’m relaxing my toes. Then, I relax my toes. I’m relaxing the balls of my feet. Then, I relax the balls of my feet. I’m relaxing my arches. I relax my arches. I’m relaxing my heels, and the top of my feet, my ankles, my calf. Sometimes, I’ll even do my lateral calf, my medial calf, my shins, my knee caps, behind my knees, my quads, my hamstrings, my hips, my glutton. You physically relax them. Then, you move your way all the way up. Now, if you get distracted, you can start it all over again or you can just pick up where you left off. If you get all the way up to the top of your head, and you’re not sleep yet, then you just start from your toes again. Very rarely do I have to start all over again. That’s a really good one that you can try when you’re just feeling tired but wired like you cannot get yourself to just rest. The next one, do you feel ineffective? That’s a really good one, right. You just feel like, “Why am I even here?” Pause right now and get something small completed, whether it’s responding to an email, loading up the dishwasher, or packing your gym bag for your next trip. Good job. I think that’s a really good one. I mean, the feeling ineffective comes from your thinking. Of course, you can spend some time just going like, “Why am I choosing to think that,” but, sometimes, I have found that if I’m really in that place and everything is off and I’m not okay, it can be hard for me to do some good self-coaching. Getting a couple of things done helps to bring me out of that. From that place I can start going, “Now, why was I feeling so ineffective? What was I making it mean that I haven’t done things? What are my thoughts about that?” Then, I’m able to maybe change that for the next time or not get lured back into it, sucked back into it again. The next one is, do you feel unattractive? It says, “Take a goddamn selfie.” Your friends will remind you how great you look, and you’ll help fight society’s restrictions on what beauty can look like. You can do that if you want to if you’re a selfie person. I think that, first of all, feeling unattractive comes from what your thoughts are about yourself. When your reign is in this place, of course, again, it’s going to show you all the reasons why everything is horrible, including what you look like. Something to think about with that. Just understanding that it’s your thinking. I think that what makes us feel unattractive is when we haven’t showered in days, when we’re not dressed. Maybe you want to put some makeup on, or do your hair, or do something that just helps you to feel like you’re showing up. Put a little bit of jewelry on, or some nicer shoes than your sleepers, or just like the scrubby shoes you wear around at work all the time. Something like that can help you to feel like you’re up-leveling your appearance and makes you feel better about yourself because of the change in thinking that you have. Next one is, do you feel paralyzed by indecision? Give yourself 10 minutes to sit back and figure out a game plan for the day. If a particular decision or problem is still being a roadblock, simply set it aside for now and pick something else that seems doable. Right now, the important part is to break through that stasis even if it means doing something trivial. I think that’s true. I mean, I think, for most of my clients, we aren’t in that place of totally not being able to function in life due to indecision. Definitely, there’s a lot of indecision going on for lots of different things for everybody, every human being. Understanding that indecision is an indulgent emotion and doesn’t take you anywhere, it just makes you feel bad and doesn’t actually help you make a decision is important. If you give yourself those 10 minutes to sit back and come up with a game plan, you might do like what I’ve taught you before in this podcast is decide to not decide, or you might decide, “Okay, I’m going to make a decision by the end of the day, or the end of this week, or I need more information. I’m going to go get that information, so I can make the decision.” Actually move forward on it, rather than just circling around, circling around in indecision. The next one is, have you overexerted yourself lately physically, emotionally, socially, or intellectually? That can take a toll that lingers for days. Give yourself a break in that area whether it’s physical rest, taking time alone, or relaxing with some silly entertainment. For those of us who are introverts, socially overexerting ourselves, definitely, can make us feel like everything is awful and you’re not okay. Raise your hand if you’re like me, and you’ve done that where we think, “I should be having this amazing life like everybody else on Facebook.” When I try to recreate that for my family, I kind of want to die. Taking that time, whatever you need to do, sleeping more, not doing anything extra, just getting done, the very minimum for a few days might be what you have to do. Then, it’s important to learn from that as well, so you can anticipate it in the future. You have had that experience, and you go, “Hey, if I ever have a weekend like that, I just know what needs to happen. I need to be going to bed early every day for the next three days,” or whatever it ends up being that ends up working for you. For sure, taking a call, or running around, being up on delivering babies, doing cases, whatever it is that you’re doing can feel like an overexertion of yourself physically and emotionally, for sure. Even intellectually, there’s a lot going on. You’re really thinking a lot, or you’re preparing ground rounds, and you’re putting together a big presentation of some sort, you can feel really, really drained from that. I think it’s important to pace yourself, but with a call, you can’t really do that, doing whatever you need to do in that moment. Then, plan for how you’re going to rejuvenate yourself at the end. Go home, take a shower, either put on pajamas, and go to bed, or put on real clothes and get something done, so you’re feeling effective, you’re feeling like you’re moving on, and you’re doing all the things you need to do to care for yourself well. Get some groceries, make sure you’re going to have a good solid meal, it’s time to eat, all of those things. I love it how it says relaxing with some silly entertainment. I’m telling you what, there is nothing like watching a comedy special. Ellen De Generes has a new one on Netflix. I think she’s a riot. I mean, there’s nothing like watching comedian, and just like laughing until your sides hurt. If that is something that interests you at all, definitely think about it. Netflix has a whole bunch of comedy specials, HBO does. There’s, definitely, a lot that’s available to you. Sometimes, we just need to be patient and allow ourselves to be in the sock. Just, “This is what it’s like every now and then. Maybe it’s hormonal. Who knows what happening? I can just be with this for a few days. I don’t need to resist it and think something is going wrong. I can just be with it for a few days, and be patient with it, and let it pass.” If doesn’t pass, of course, then you’re going to take some steps to figure out what that is. At the end it says, “You made it this far, and you will make it through. You are stronger than you think.” I agree, you’re definitely stronger than you think you are. Don’t forget these skills that I’ve taught you in here. This stuff is life-changing. It can really, really turn you around big time. Again, Everything is Awful, and I’m Not Okay: Questions to Ask Before Giving Up. I think that there are going to be many of you who are going to find that this might be a helpful handout for you to have in your office. It might be a helpful handout to have for you on your own home, for yourself, for your family members, for anybody that you know who struggles from time to time, which is basically every single human. All of us. Go ahead and head out to my show notes page. Again, katrinaubellmd.com/108, and you’ll be able to print this off. Have a wonderful week, and I’ll talk to you next time. Take care. Bye-bye. Thanks for this! I have a lot of depressed teens and moms in my pediatric practice. I think this will be a blessing to them.